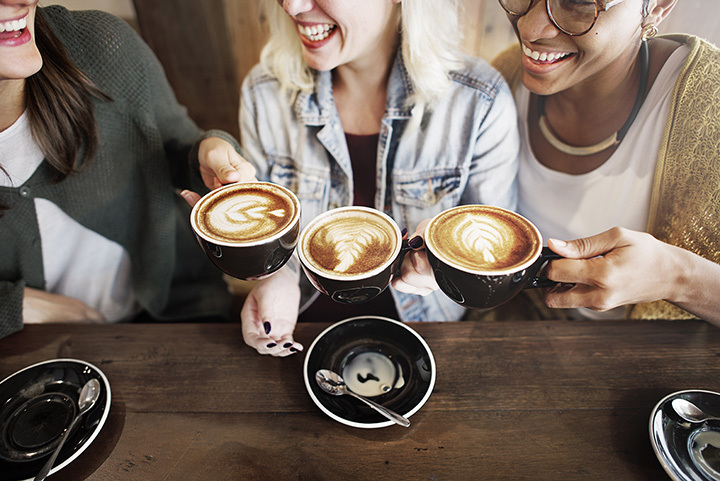 Whether making a quick stop for a cup of eye-opener in the morning, or bringing a mobile device or even a book and settling in for a long, quiet afternoon, a coffee shop can be a great place to make that stop. There is no shortage of options for coffee shops in Michigan, and so, we offer up a list of 10 of the best sources for pressed bean juice—both hot and cold—and other items in Michigan. Those making an entrance into the state via U.S.-131 may want to stop in Three Rivers, where LA's Coffee Café has been operating for over 10 years. Serving Death Wish Coffee, some of the strongest known to man, nitrogen cold-brew coffee, and an array of baked goods and other drinks in house, this family-owned operation provides a touch of history with its coffee, as its current location is in an old powerhouse on the Rocky River. Its connection to the local scene is second to none, as the shop even engages in public beautification programs along the Rocky River. Boasting four locations in Kalamazoo and Portage, including one on the titular Water Street in downtown Kalamazoo, Water Street isn't just a coffee shop, but it's also a coffee roasting shop. Even when you're not at Water Street, getting Water Street coffee in and around Kalamazoo is actually almost tough NOT to do as many businesses stock Water Street coffee to serve with meals. Those who go to a Water Street location, however, will find not only that iconic coffee blend on hand, but also a variety of sandwiches, sweets, teas and other edibles and drinkables awaiting. It would be easy to dismiss Biggby as it's a chain coffee shop, and even found outside of Michigan. But it was likewise hard not to include Biggby as it's a chain that got its start in Michigan. Essentially the Michigan Starbucks, Biggby Coffee started out in East Lansing—home of Michigan State University—in 1995, and ever since, it's been growing not only throughout the state but into others. Its claim to fame is a 20-ounce "grande" cup that runs about $2.00, a point that Starbucks can scarcely claim. Also stop in for seasonal favorites and some wholly unique brews like Michigan Cherry. Those who head farther north into Michigan and hit Holland will have no shortage of sights to see, but one to catch in particular is JP's Coffee and Espresso Bar. JP's is home to the Home Barista Training Class, offered in conjunction with the Midwest Barista School. Those who take the coffee classes will learn how the pros make coffee drinks, and thus have the ability to take what's on hand at JP's home with them. Naturally, we can't talk about prime coffee spots in Michigan without hitting Detroit, and Detroit's got at least one terrific place to go that's all about the ambiance. Great Lakes Coffee in the heart of Midtown Detroit offers not only reclaimed wood from Hamtramck houses as part of the internal decor, but also locally-sourced metalwork and internal brick. An outdoor patio lets patrons enjoy the comparatively rare good weather in Michigan. Great Lakes Coffee offers a complete array of beverages, including beer and wine, and will even give the competitive a place to stretch muscles with a Wednesday trivia night. If the idea of settling in at a place that's described as "one part Cheers and one part Hogwarts" catches your imagination, brace yourself for an extended stay at the Raven Café in Port Huron. Couch seating on the second floor comes surrounded by books and an impressive river view, and those who came for the beverages can get the standards, but also a line of coffee shakes in flavors ranging from gingerbread to coconut mocha. A full bar is even in place for those who want something harder, and live music is on hand nearly every evening to round out a cultural experience. Those willing to face the hustle and bustle of downtown Grand Rapids can have one magnificent experience ahead of them in the form of Madcap Coffee, featuring coffee that's as well-traveled as the baristas, who by some reports dedicate months to traveling and finding the right beans. Considering that those baristas have won awards as well, it's clear that Madcap Coffee understands coffee as few coffee shops do, and that makes this more than worth a stop in. Farther into the state heading north in Alpena, the Cabin Creek Coffee company awaits. Family-owned for nearly a decade—and we all know what kind of quality can come from family ownership—the coffee shop not only boasts a cabin-style appearance, but offers a wide array of treats for patrons to get into. Perhaps the biggest winner here is the sandwiches, offering, for example, a Monte Cristo sandwich on toasted cinnamon bread, complete with a gouda cheese accompaniment. While the Muskegon Drip Drop Drink location is itself known for excellent coffee—the Cubano Chocolate is especially recommended, a combination of raw sugar over espresso, then another dose of sugar added before the mix is steamed—it's the location that may make this one a prime stop. Located in the same building as the Unruly Brewing brewery and Rebel Pizza, it's effectively a one-stop shop for just about everything you could ask for in your Friday or Saturday night and the next morning afterward. Those who just want coffee, though, will have a ton of choices, as Drip Drop Drink serves Counter Culture Coffee and goes through 22 different blends. Rated Michigan's Best Coffee Shop in the 2015 MLive judging, Black Owl Café in Kalamazoo offers not only a killer aesthetic—once again, reclaimed wood makes an appearance, as does vintage photography, a variety of mirrors, and coffee bag labels printed by children's book artist David Bain. Throw in a mix of drinks—including a logic-defying Vegan hot cocoa—and it's an experience that should be tough to forget. There's a little something here for just about everybody, whether needing a quick sip, a full lunch, or a night out. Even better, there's more where this came from, so those looking for coffee in Michigan will have more choices than they likely know what to do with.